We've designed a new Web 2.0 style graphics set for your ecommerce plugins and shopping basket as well as giving you much greater control over the layout, fonts and style of your ecommerce plugins. You'll also notice a few other improvements in your admin console to make it easier and clearer to add ecommerce to your website. Where ever you see this button: next to a product or product category, you'll be able to save some time and click straight through to the Add Ecommerce To Your Website page for that product or list of products in the category. We've designed a new range of Web 2.0 style built-in ecommerce button sets to give you a great looking ecommerce solution 'out of the virtual box'. 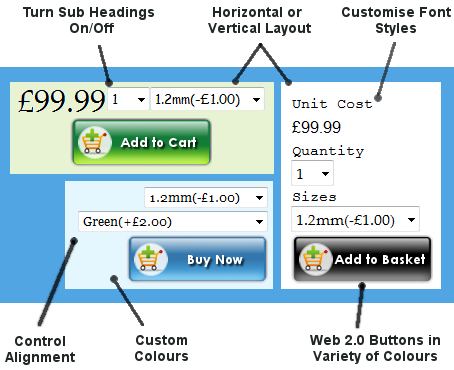 With our range of 8 different coloured button sets offering either Add to Basket or Add to Cart terminology, there is sure to be one set to match your website. Take a look at the new button range in your admin console Appearance Manager. We've also updated the checkout process workflow graphics to give them a Web 2.0 look. The Appearance Manager now gives you ultimate control over the look of the 'Interactive Price Tag' and 'Interactive Buy Now Price Tag' ecommerce plugins. You'll easily be able to create a look that fits your website. You've now gained the ability to control the following aspects of your plugin's appearance.